You’ll be amazed at what the best technology can do for you. When you bring the 2017 Jaguar XF home, you’ll know what it’s like to be surrounded by innovation and fun. This new model brings so many entertainment and information features to life, which is why it should be at the top of your list. Take a look below to learn more about this new model and the tech it has to offer. Providing the right amount of entertainment inside a vehicle is easy with Jaguar InControl®. This infotainment system packages all the information, entertainment, and connectivity you could want into a fun-to-use package you’ll certainly enjoy. 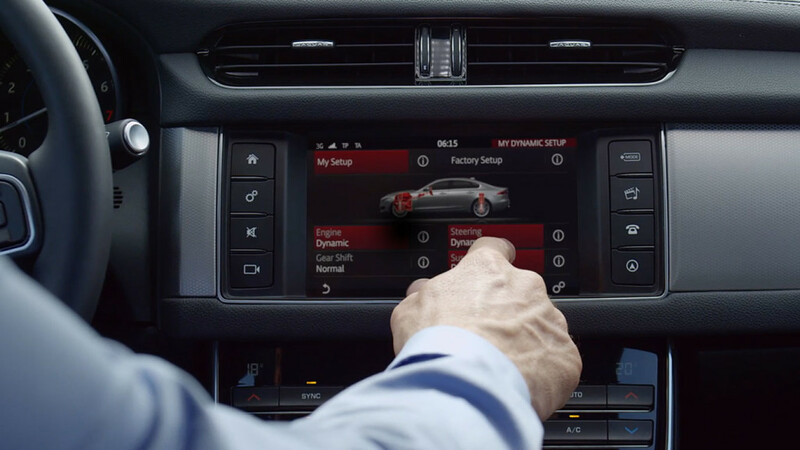 The InControl Touch™ infotainment system provides the Jaguar XF with plenty of excitement. The eight-inch color touchscreen with intuitive swipe and controls allow you to have better control of the climate, audio, and available navigation. If you’re looking for more, the InControl Touch Pro™ brings the technology up further by giving you a 10.2-inch touchscreen and a customizable high-definition 12.3-inch TFT instrument cluster. Both screens are user-friendly and come with a range of innovative features. The InControl Remote™ and Protect system allows you to monitor your vehicle through your smartphone. You can track adventures, lock/unlock your vehicle, and even start the engine to heat or cool the cabin. You can also access an SOS Emergency Call or receive Roadside Assistance when you need it most. When you’re driving through Baltimore, take everything in with the available Wi-Fi hotspot. Now, you can connect up to eight devices for a better experience when on the road. It’s important that drivers have the right information when driving through Washington DC. The head-up display system uses laser technology to project a range of important information onto the windshield. Now, drivers can receive notifications and have access to pertinent information at all times. Aside from having the best entertainment and information, having a great sound system can make the drive through Arnold more enjoyable too. The Meridian™ 380W sound system provides an acoustic range through 11 different speakers. The optional Meridian 825W surround sound system also delivers crisp sound, while the using audio technology to give you a rich experience. The 2017 Jaguar XF delivers some of the best technology for all your entertainment and information needs. With plenty of tech features to keep you enjoying the road, you’ll find it hard to ever leave this vehicle behind. Visit our dealership at 101 Ferguson Road in Annapolis to see our new vehicle inventory and explore the technology for yourself. You can also contact us online or call us at (410) 904-3107 to schedule a test drive, apply for financing, or learn more about this impressive new model.